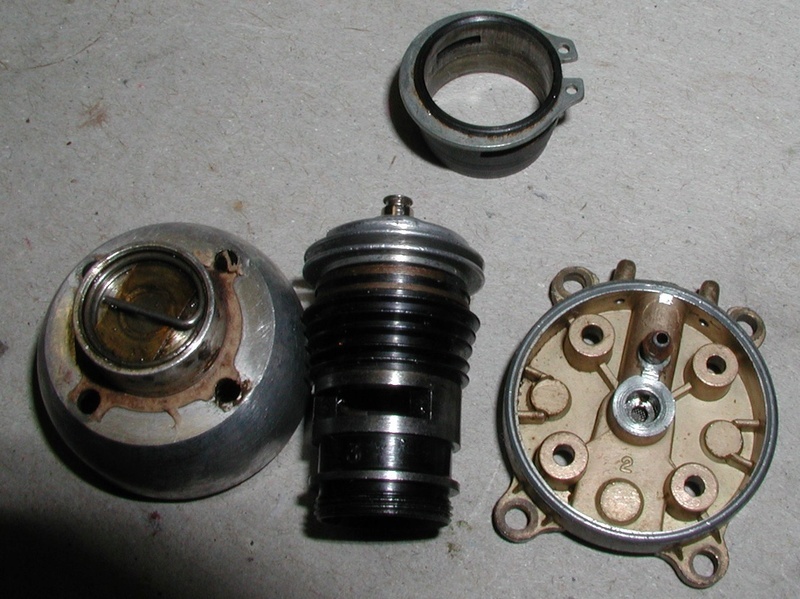 Turned down cylinder fins, high compression head, #3 grooved cylinder with throttle ring, 2 milar reeds. Made up? Two top fins gone, nicely done probably on a lathe. Too nice to be filed. As found, ebay $14.50 9 bids. I thought the reed felt a little stiff, cleaned it and when I picked it up it separated into two reeds. I tried to ID it using the Cox handbook and found two possibles. I think it's just a 350-1 that someone had some fun with. Two reeds, some hop up/hop down mod? or more probably just stuck together when installed. Nicest looking used back plate I've seen in quite a while. Well, it’s really neither of the two. It could have possibly been one of them at one time, but it’s been modified into something else. 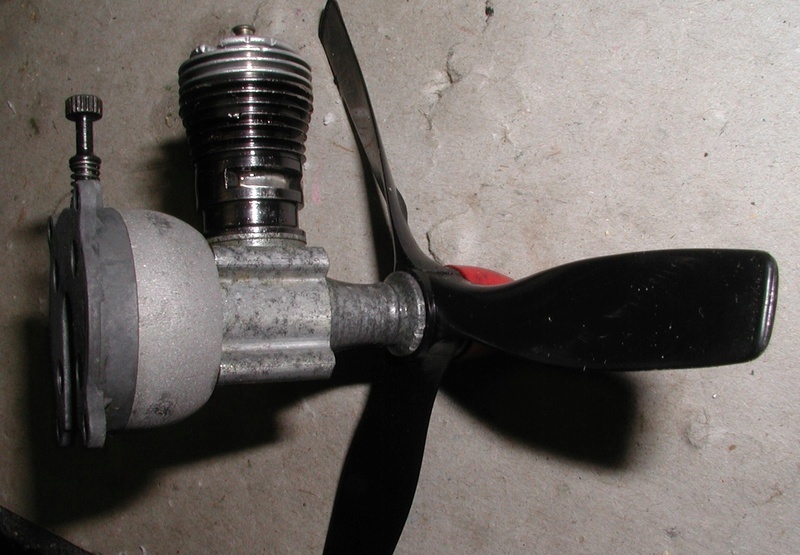 Something to clean up or use for parts or fly with without worry. ticomareado wrote: Nicest looking used back plate I've seen in quite a while. Yes, surprising considering how castor locked the reed was. I was expecting a mess when I separated the plate from the tank. I couldn't find anything else in the book that even came close Ron. 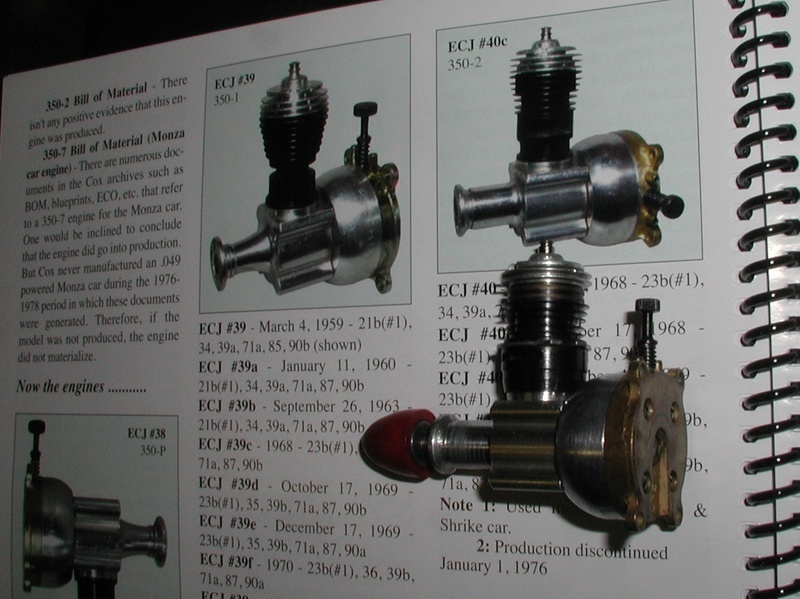 It's a standard #3 cylinder polished for a throttle ring with a high compression head. 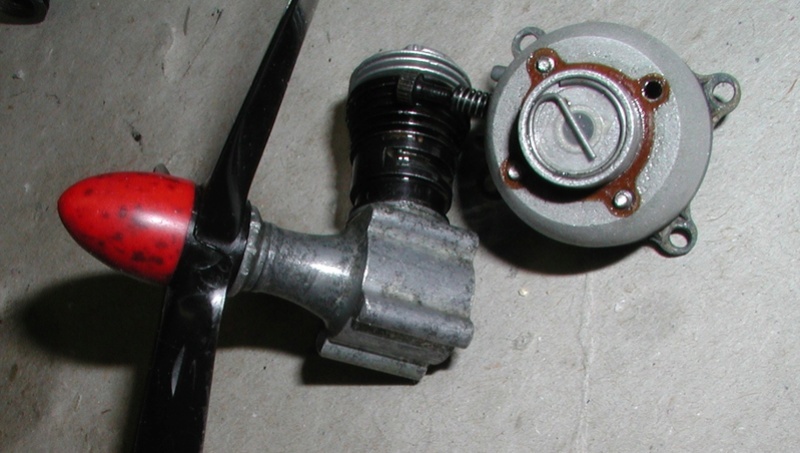 Perhaps it was grafted on a straight nose non grooved case that at one time housed a starter spring. 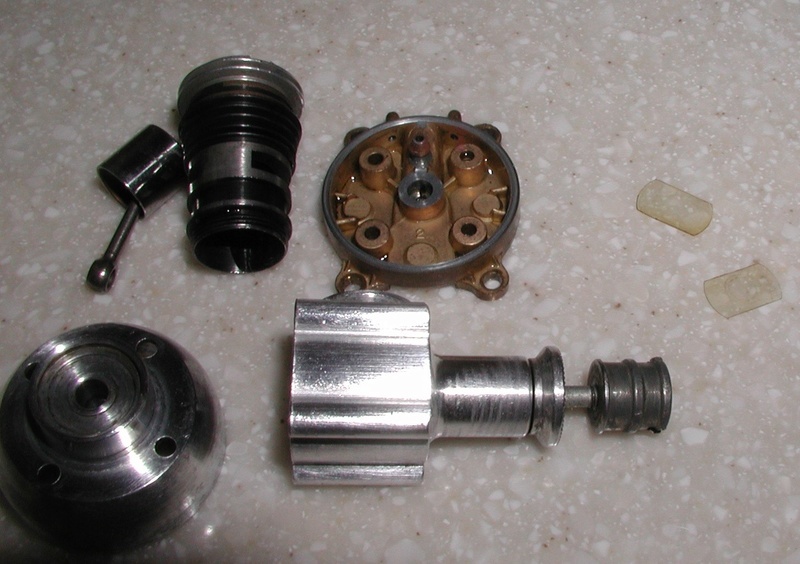 I rebuilt it the same only replacing gaskets, eliminating one of the reeds, and adding a spinner. 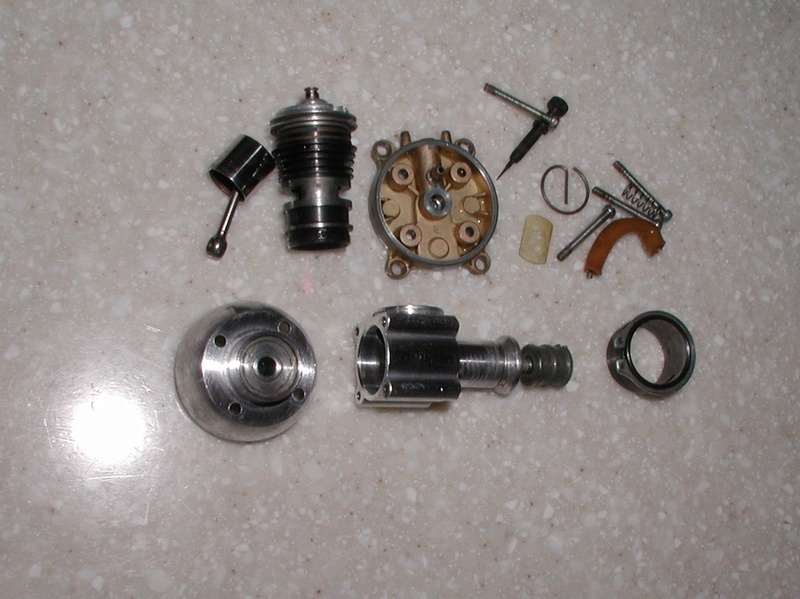 The most curious part is the elimination of the two top cylinder fins. That's a lot of effort just to clean up some damaged fins and the result is more bad than good cooling wise. 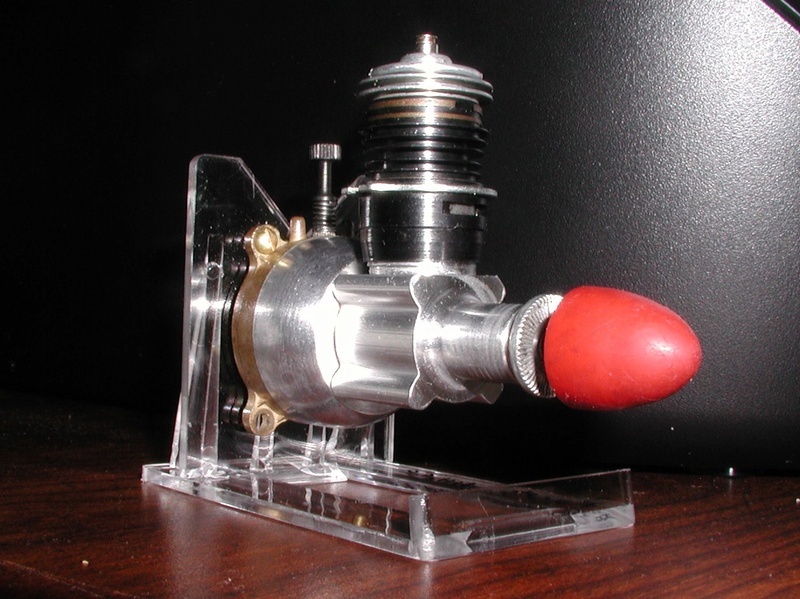 Perhaps a home job to use on an RC boat with throttle and heat sink head? 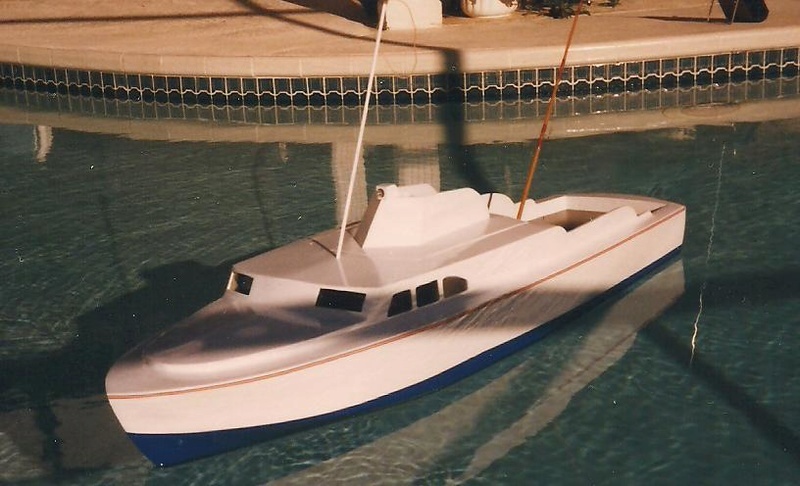 Good guess but I'd go with a heat sink head R/C car before an R/C boat on this one. A stock Baby Bee tank holds just enough fuel to get an R/C boat out in the middle of the lake and stop. 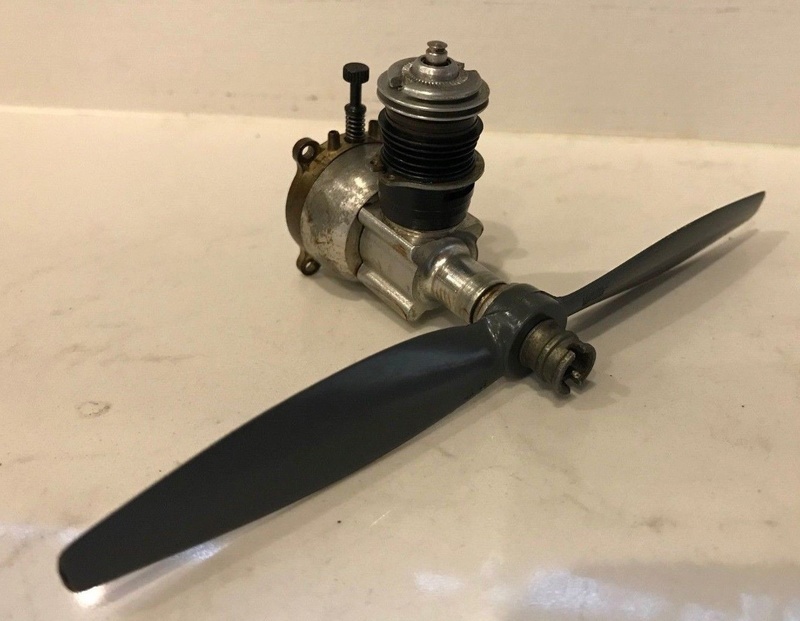 It came with a propeller attached (top picture). Each of these little engines has a story to tell. 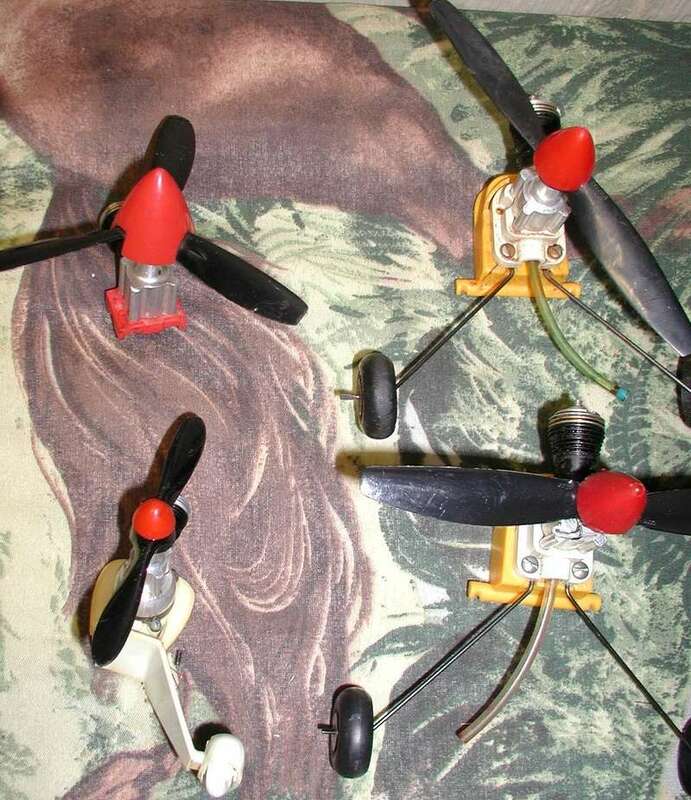 These for examples: One flight only, or lot's of fun. Or this one. Looks like it was stored in battery acid, yet the mounting screws and reed look new. ticomareado wrote: Good guess but I'd go with a heat sink head R/C car before an R/C boat on this one. 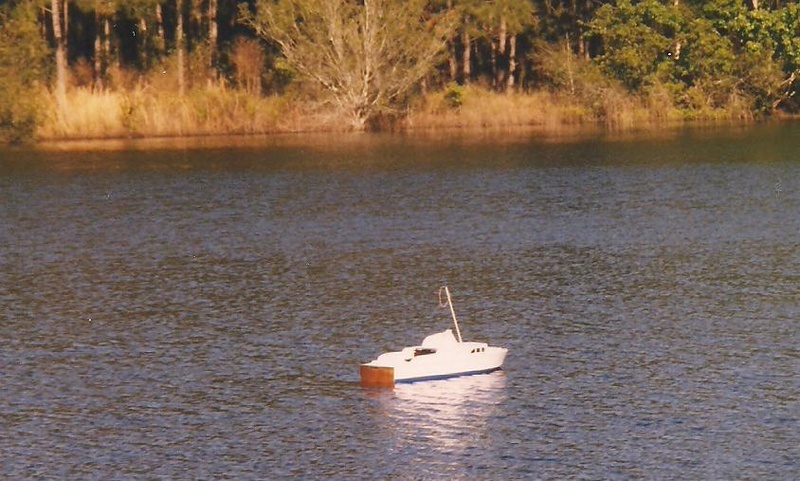 A stock Baby Bee tank holds just enough fuel to get an R/C boat out in the middle of the lake and stop. I trusted electric with mine. 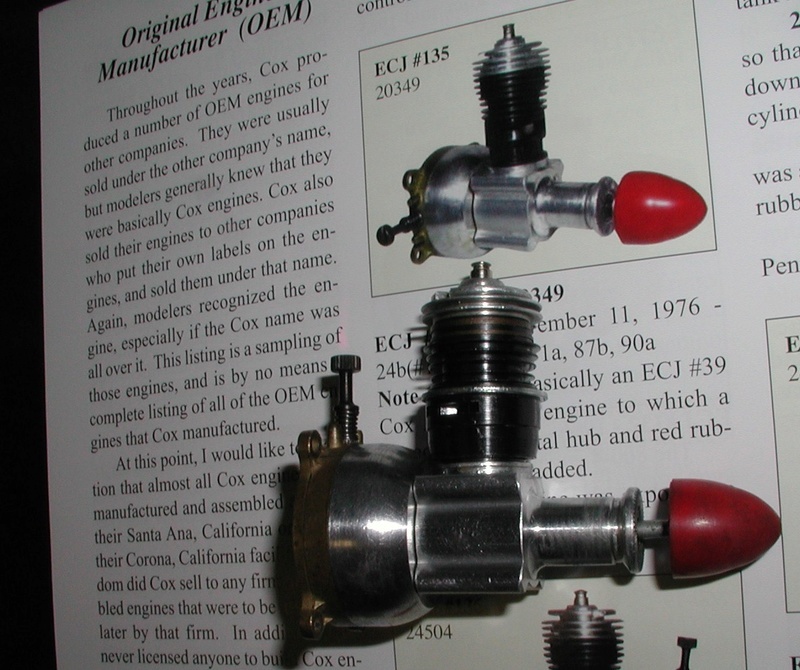 Regarding the two mylar reeds in place on the Baby Bee, a few years ago, one of the many things I acquired from the Cox R&D batch that showed up, was a Red Cox Shrike car with the Baby Bee pusher setup. It was totally frozen solid which helped get a really good price from the guy. Once I got it home and took it apart, it was apparent that the Shrike was a customer store return that made it all the way back to Cox. The tank had been filled by the original purchaser and was left totally full of fuel for many years to end up as hard gel. When I got it all apart finally, I found that there were actually two mylar reeds put in by the factory assembly person. It would never start no matter what that caused it to end up back at the factory. The voice of experience. Same will happen with Simple Green. 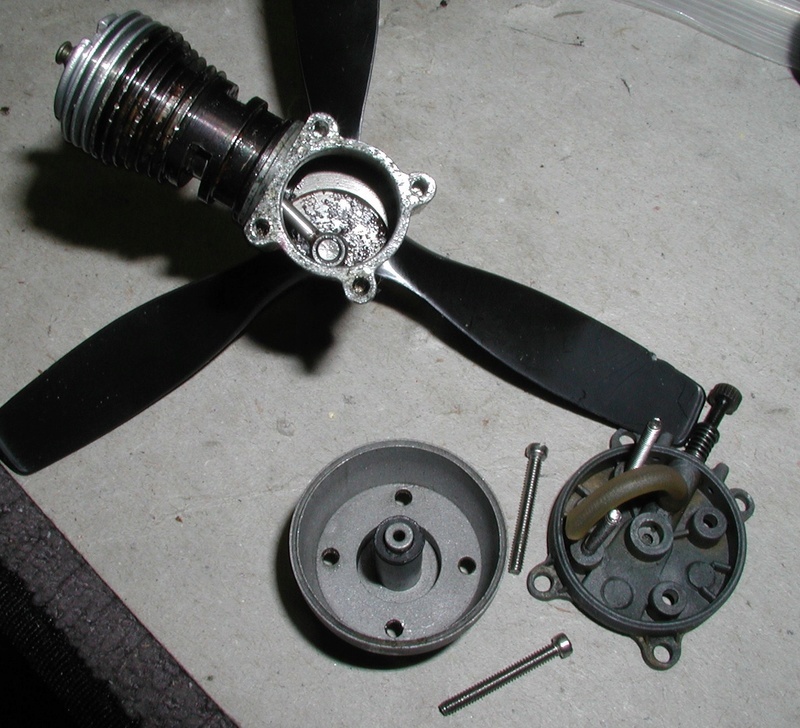 Looks like someone did just that, then replaced the gaskets and reed. I just cleaned the 3 .049's (A/F boil) and the upper right PT-19 shows a lot of castor goo while the .020 and bottom PT-19 are quite clean. But I can't agree on #1, a parking lot splat would have lunched that spinner.